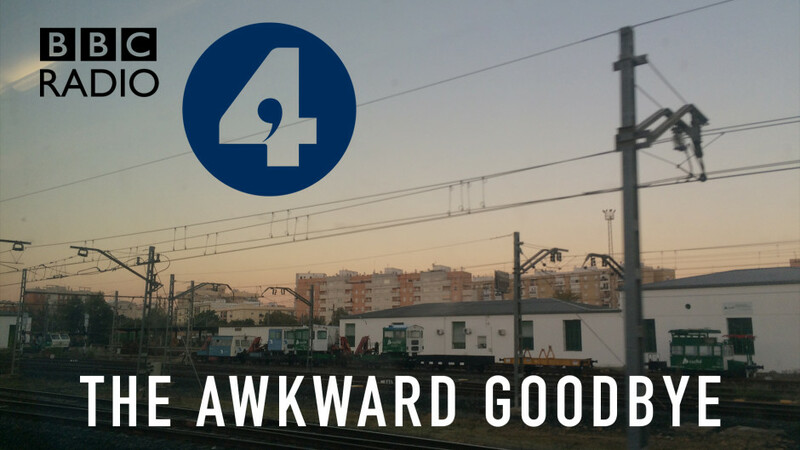 A short piece of radio I was commissioned to make for BBC Radio 4’s Short Cuts, presented by Josie Long. The story is based on my experiences with a man in Seville early one morning on the 12th November 2015. Saying goodbye has never been so awkward. One morning, instead of saying “see you later” or “nice to meet you” like you might expect, a grown-man I shared a taxi with to a train station in Seville, upon finding out we were both also about to get the same two hour train together, turned and literally sprinted away from me full-pelt in the middle of the station. Instead of enduring two hours of my chat, or politely saying farewell, a man actually full-blown ran, not walked, ran away from me without warning. Unbelievable. What a way to help my insecurities about social interaction. Listen to the full episode ‘Never Let Me Go’ on the BBCiplayer, download directly or subscribe to the podcast on itunes. Commissioned by: Eleanor McDowell at Falling Tree Productions for BBC Radio 4’s Short Cuts, presented by Josie Long. Featured on: Short Cuts, Series 15, Episode 1/8, ‘Never Let Me Go’. First Broadcast: 13th February 2018, 3pm BBC Radio 4.